Tees Valley Guinea Pig Rescue was founded in December 2014 because I saw a need for a specialist guinea pig rescue in the Teesside/Tees Valley area as the nearest good rescues were over 25 & 45 miles away. We have 14 permanent 4ft indoor hutches (or equivalent area) plus cages & fosterers who can take any excess. We only rehome solo piggies if they are going to live with another piggy. 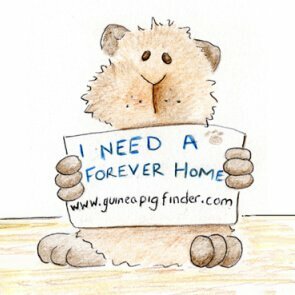 We prefer that our piggies go to homes where they'll be living indoors but understand that this isn't always possible so will rehome to live outdoors between May & September. We try to bond all our solo piggies but often we have to have solo boys neutered so they can live with females without fear of pregnancies. All of our piggies are kept here for at least 2 to 3 weeks to ensure they're in good health & to assess their behaviour so we can advise the best piggy to suit each adopter. We also offer a free bonding service where you bring your bereaved or solo piggy here to find a new friend.